Kieran has been in practice since 1978 and has a wide variety of experience in the principal areas of general practice namely,litigation, conveyancing, commercial and general probate work involving Wills and estates. His work would have a bias towards litigation, in particular, personal injury litigation, together with various aspects of commercial conveyancing. In addition, he has acted as a panel solicitor for a number of insurance companies but would, predominantly, represent Plaintiffs in personal injury actions. His work covers attendances in all Courts, including High Court, Circuit Court and District Court involving all aspects of civil and criminal litigation. 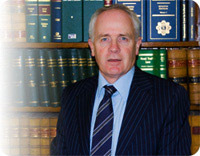 Kieran is a Manorhamilton native who returned to his roots in 1978 having lived in Dublin and attended Trinity College, where he graduated with an Honours Degree in Legal Science and, thereafter, obtained a Post-Graduate Degree in Law before being admitted to the roll of Solicitors in 1978.